The organization of Paris into its 20 arrondissements, spiralling out from the Ile de la Cité, seems so well established that you may be surprised to learn that the arrangement is only 150 years old. Today’s arrondissements date from exactly January 1, 1860. On that day, the city was restructured and 11 surrounding villages or communes were annexed: Auteuil, Passy, Les Batignolles, Montmartre, La Chapelle, La Villette, Belleville, Charonne, Bercy, Vaugirard, and Grenelle, along with some bits and pieces of territory that fell within the Enceinte de Thiers. Today, some of these areas retain faint traces of their bucolic past –a few winding roads, some country houses now hemmed in by urban development, glimpses of trees that were once part of orchards and are now marooned in courtyards. But in 1860, they instantly became “urban” and had to leave behind their rural roots. 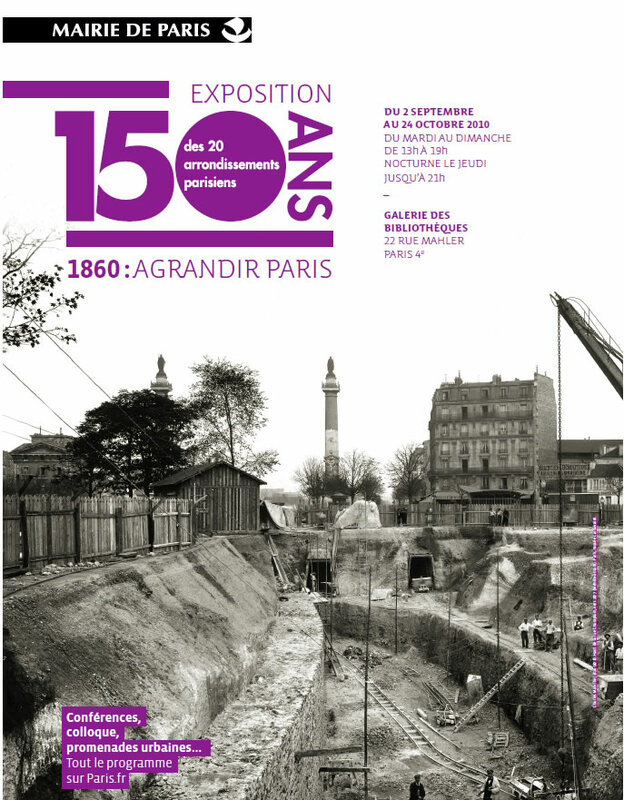 If you want to understand more about this watershed in Paris’s history, go to an exhibit called “1860: Agrandir Paris: 150 ans des vingt arrondissements parisiens” at the Galerie des Bibliothèques, 22 rue Malher, 4th arrondissement (2 September to 24 October, 2010), which commemorates the reorganization and annexation of 1860. And if you can’t visit the exposition, the section of the City of Paris website devoted to this topic is well worth a visit. Among other features, it offers downloadable walking tours that start in the city and head out into the banlieues – what urbanists would call a “transect walk” that provides a sense of how former suburbs have been absorbed into the city and become urbanized and suggests how current suburbs may evolve over time. The 150th anniversary has also prompted a series of talks at local libraries and mairies as well as sites such as l’Arsenal and le Petit Palais that highlight some of the political and social effects of this dramatic alteration in the shape and organization of the city. All of this made me wonder how the city had been organized in the past. In the Middle Ages, the city was divided up into quartiers named for local churches – in other words, parishes (paroisses). 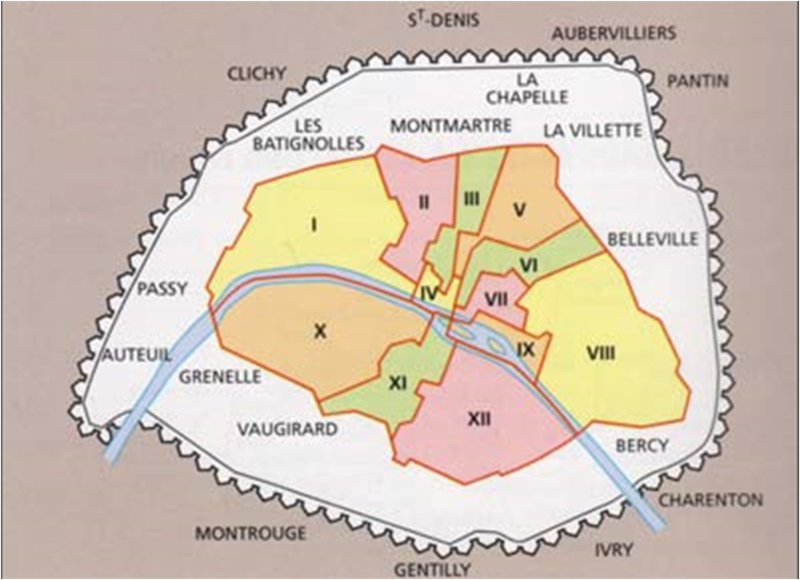 The Atlas de Paris (Parigramme, 1999) shows 21 parishes in the central city in the 13th century. Some have familiar names (St Eustache, St Sulpice) and some are named for churches that have long since disappeared (Saint Benoit-le-Bétourné, Saint-Jean-en-Grève). A few old parish names survive into the present as Paris districts, such as St- Germain l’Auxerrois, St-Merri, and St-Gervais. More parishes were added in the 17th and 18th centuries as the city expanded, and by the time of the Revolution, there were 52 parishes within the city and 13 outside the tax wall of the Fermiers-Généraux, built between 1784 and 1791. The wall was punctuated by barrières, just as the circumference of today’s city is punctuated by portes. These included the intriguingly named Barrière des Rats, the Barrière de Croulebarbe, the Barrière des Vertus, and, of course, the Barrière d’Enfer (now Denfert-Rochereau). In 1790, the Revolutionary government that tried to establish 10-day weeks (big mistake) and rename the months with names like Floréal and Messidor, also imposed a new order on the city – 12 arrondissements (or municipalités), each one divided into four sections, some with militantly Republican names, such as l’Unité, Fraternité, Fidelité, l’Indivisibilité, Contrat Social, Droits de l’Homme, les Amis de la Patrie, and even – I kid you not – Brutus. The arrondissements were organized quite differently from their modern counterparts. So today’s 1st arrondissement is not where the pre-1860 1st arrondissement was located, and so on. Here’s the pre-1860 arrangement. Finally, in 1860, the Emperor Napoleon III and his prefect Haussmann created the arrangement we know today. They retained the system of dividing each arrondissement into four quartiers, but abandoned the Republican names in favour of more traditional appellations (goodbye Brutus, hello Sentier). The way in which we define and name neighbourhoods is not just a matter of administrative convenience, because it becomes part of the identity of people who inhabit that neighbourhood. Paris’s parishes, sections, and quartiers are integral to the lives of their residents. But behind the numbered arrondissements lies a history of parish saints, republican virtues, and vigorous attempts to impose order and rigor on an ever-evolving city. More information: For a complete list of the 48 sections created in the Revolutionary period, click here. For a complete list of the 80 current districts/quartiers, click here. Most cities are messy-looking entities, sending tentacles out into the surrounding areas, sprawling like inkblots or oozing along coastlines. The City of Paris is as neatly packaged as an egg within the Periphérique motorway, which follows the line of a former city wall. Within the city are further circles, indicating previous walls. 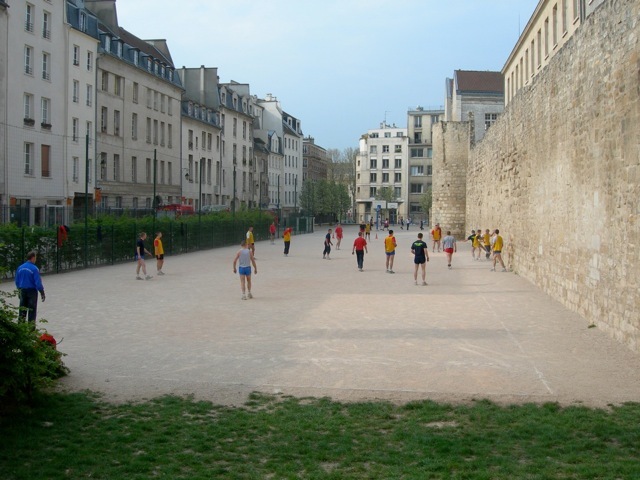 Paris has been a walled city for much of its history; the walls defined the city, even if they did not always protect it. This map from a 1950s-era Michelin guide shows the successive walls that have circled the city, from Roman times to the 19th century. Wall No. 2 was built by Philippe-Auguste between 1180 and 1225. You can still see part of this wall in the Marais (4th arrondissement), parallel to the rue St-Paul. It’s next to a sports ground and across from the Village St-Paul. Wall No. 3, built by Charles V in the late 14th century, enlarged the city on the Right Bank. You can see part of the base of the wall in the complex underneath the Louvre (enter the Carrousel du Louvre from the rue de Rivoli). The ornate Porte St-Denis and Porte St-Martin, two triumphal arches at either end of the Boulevard St-Denis, stand where two of the gates of this wall once stood, but they are later replacements of the original gates, constructed in the 17th century. Wall No. 3 also left some odd little hills here and there, the garbage dumps of previous centuries. In the Middle Ages, city dwellers tended to fling unwanted stuff off the walls into the ditch outside; when the walls came down, these hummocks of rubbish remained. Wall No. 4, built by Louis XIII in the 1630s, added even more Right Bank territory – essentially, all of what now constitutes the 1st to the 4th arrondissements. This wall earned the nickname “mur des fossés jaunes” (wall of the yellow ditches), because it was made of yellowish limestone. It was torn down after about 50 years, because the authorities believed that Paris was safe from invasion. Where this wall had once stood, a series of broad avenues or boulevards were created. The word boulevard comes from the term for “bulwark,” and originally, boulevards were broad promenades associated with existing or demolished city walls. Well before the days of Haussmann, Paris already had many wide, tree-lined promenades, built on the site of former walls. Another term defined by Paris’s walls is faubourg. The faubourgs (faux-bourgs, false burghs, or sub-urbs) were the areas outside the walls, named for the nearest city gate. 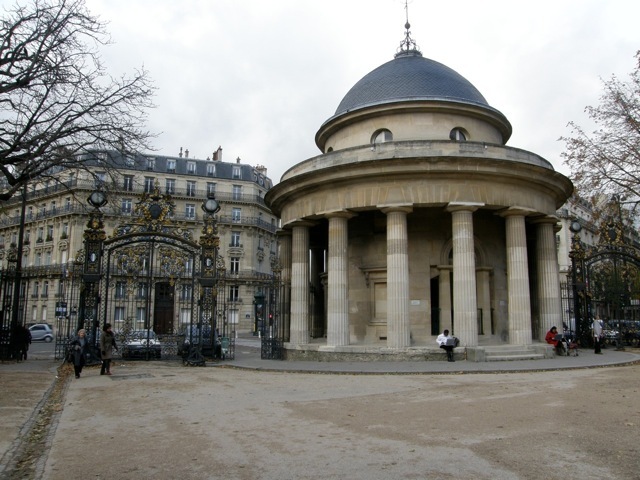 So the Faubourg St-Germain was the area beyond the St-Germain gate, the Faubourg St-Honoré beyond the St-Honoré gate, and so on. 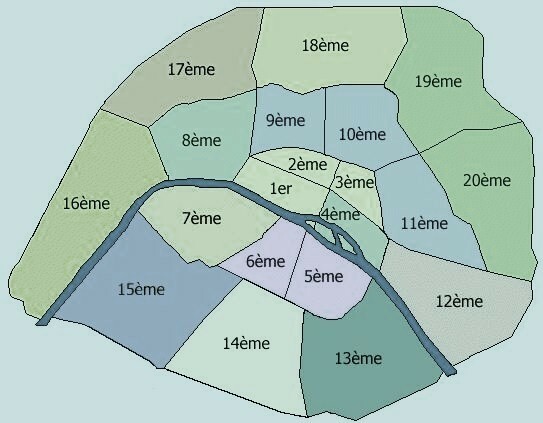 Today, the map of Paris retains the names of eight faubourgs: St-Honoré (8th), Montmartre (9th), Poissonnière (9th/10th), St-Denis (10th), St-Martin (10th), du Temple (10th/11th), St-Antoine (11th/12th), and St-Jacques (14th). These areas are outside the very centre of Paris, but well within the modern city boundaries. Wall No. 5 represented a huge expansion, and added most of what are now the 8th to the 11th arrondissements on the Right Bank, as well as parts of the 12th to the 16th to the east, south, and west. (The former faubourgs were included in this wall.) This was the wall of the Fermiers-Généraux (“tax farmers” or tax collectors), built between 1784 and 1791. All goods moving in and out of the city were taxed as they crossed this wall. The wall was still being built at the time the Revolution broke out in 1789. Anger about the taxes and customs duties no doubt contributed to Revolutionary sentiments. The Fermiers-Généraux walls have left other, more modern traces. If you superimposed the map of the Metro on the line of Wall number 5, you’d see that Metro lines 2 and 6 follow the outline of this wall. Again, wide boulevards have replaced the former fortifications. Wall No. 6, the last of the series, was the Enceinte de Thiers, the useless fortifications built in the 1840s that failed to protect the city when it was under attack in the 19th and 20th centuries. The wall took in many former villages that had sprung up around the city, which were annexed to Paris in 1860. 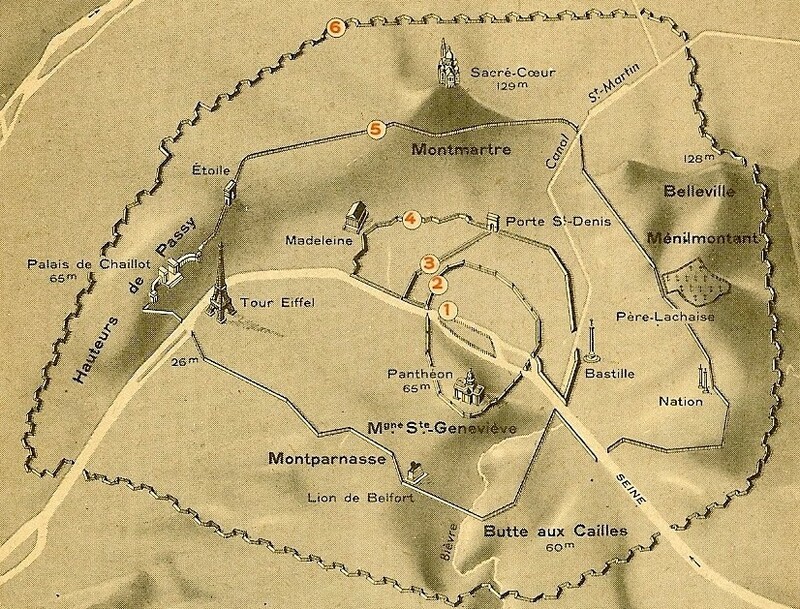 The Enceinte de Thiers was dismantled following the First World War. The space just beyond the Enceinte, consisting of a ditch and a wide slope traditionally left just outside fortifications (to allow an open space for firing guns and cannons from the wall) was known as the Zone. It filled with slums in the late 19th century; Eugene Atget took many photographs of the Zone. The Zone was eventually cleared away and the Periphérique highway was constructed on part of the remaining space between 1958 and 1973. Today, the Periphérique represents a wall between the largely privileged space inside the city and the suburbs or banlieues, many of them containing grim housing projects where low-income families and immigrants live. Suburbs to the north and east of the city, starting with Clichy-sous-Bois, were the site of riots in 2005. The ring road has proved to be an effective physical and psychological barrier between the inside and the out, and nobody knows how to bridge it. “Paris has another Paris under herself…which has its streets, its intersections, its squares, its dead ends, its arteries, and its circulation, ” said Victor Hugo in Les Misérables. (“Paris a sous lui un autre Paris… lequel a ses rues, ses carrefours, ses places, ses impasses, ses artères, et sa circulation.”) Hugo was thinking mostly of the sewers, but there is much more than that under Paris. Its subterranean world includes church crypts, cellars, disused quarries, catacombs, the Metro, wartime bunkers, parking lots, and utility tunnels of all kinds. This is the topography of Paris turned upside down. This picture shows a detail of a map I received from a friend who photographs disused industrial and institutional sites. It’s some of the underground landscape under the 13th arrondissement. It is every bit as complex as the aboveground map (and in some places mirrors it), but most of it is strictly off-limits to visitors. It’s the very sort of thing that attracts “urban explorers,” to whom a “No Entry” sign means have a careful look around and, if the coast is clear, go right in. The labels are intriguing. Some are the sort of things you’d expect: La glaisière (clay pit). Ancienne cave à charbon (coal storage). Some suggest an entire alternative world down there: Salle de Sculptures. Salle de la Taverne. Sauna (!). Entrée principale de l’abbattoire (entry to the slaughterhouse). There are at least 250 km of tunnels and excavations under the city – nobody knows the extent for sure, only that it’s probably even bigger than most people suspect. Victor Hugo placed some exciting scenes in his books in the sewers and catacombs and during the Second World War, the system sheltered French Resistance fighters and their Nazi occupiers alike. Today, a branch of the Paris police force is charged with keeping out intruders and checking the tunnels for damage. There are however, places where you can see the underground Paris quite legally, and they offer a unique perspective on the city. The 4th arrondissement contains some of the oldest buildings in the city, and many of the old cellars of these buildings have been turned into offices or showrooms under shops or wine cellars under restaurants. You can often see the original walls and vaulting. In this area of the city, it’s always a good idea to take the opportunity to go downstairs whenever you get the chance. Similarly, it is possible to visit the crypts of many of Paris’s churches, which often feel like a journey back in time. To see one of the oldest cellars restored to something like its original state, go to Paris Historique, 46, rue Francois Miron, in the 4th. In the Middle Ages, this was a granary where a wealthy order of monks stockpiled grain grown on their huge estates in the countryside. They were merchants as much as monks, and this was their warehouse or entrepot. The cellar has been partly restored to indicate its original construction, and the volunteers who staff Paris Historique love to show it to visitors (entry is free). 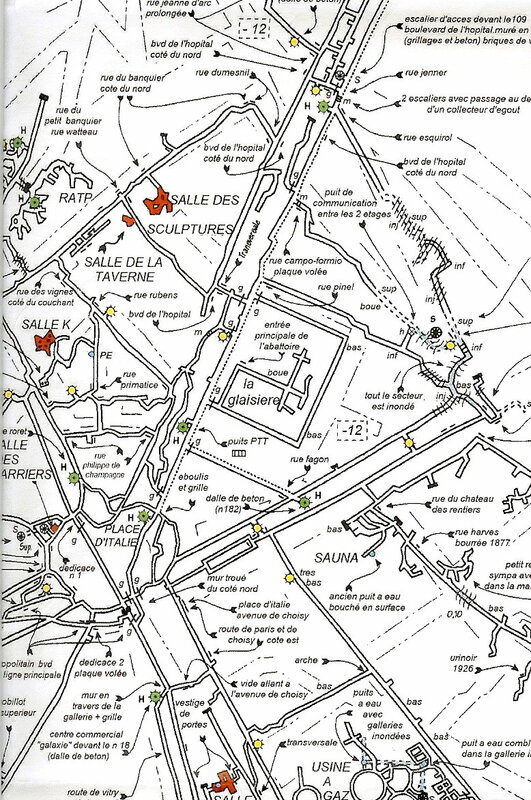 To the north and east of the city are the remains of gypsum quarries, and to the south and west are old limestone quarries and a few sandpits (sablières). One of the old gypsum quarries in the northeast was turned into the Parc des Buttes-Chaumont in the 19th, which features a lake made by flooding the quarry floor and dramatic outcrops of rock. There is a belvedere on the highest one, reached by a bridge designed by Gustave Eiffel. A terrific place for a picnic. The limestone on the Left Bank was used to build everything from Notre Dame to some of the river embankments. In the late 18th century, some of the abandoned caverns underneath Montparnasse became the Catacombs. The bones of those who had been buried in the cemetery of the Innocents in the centre of the city were moved here and arranged in artful if rather gruesome displays. You can visit the main part of them if you have a taste for the macabre. The sewer system follows the layout of the streets above them, and there are even street signs down there, so you know where you are. The sewers can also be visited, if you don’t mind the smell. Click here for more information. Parisiens are so proud of their water system they actually have a whole museum devoted to it – the Pavillon de l’Eau in the 16th. The museum is quiet and spacious and contains a special area for children – I love the idea that Paris children have a special place to learn about their water system. The Metro (officially, the Régie Autonome des Transports Parisiens or RATP) is worth several blogs of its own, but I’ll just note it here as another piece of the puzzle. The fourteen lines of the RATP began with Line #1, which was constructed just in time for the World Exposition of 1900. The newest and deepest line is the #14, officially opened in 2007. There is also the RER (Réseau Express Régional), the high-speed commuter system that links with the RATP within the city. The Metro map looks impossibly complex, but if you peel back a few layers, you will find a certain symmetry that makes it easier to navigate. Line #1 is the east-west axis slightly tilted, and Line #4 is the north-south axis, with a bit of a wiggle in the middle where it crosses under the Seine. 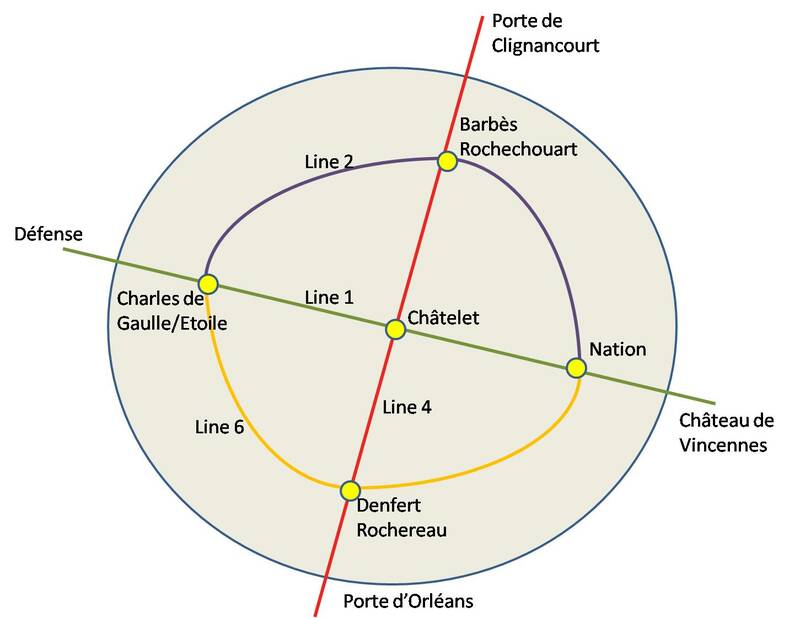 Then there is a grand circle made up of Lines #2 and #6, which connect up at Etoile in the west and Nation in the east. This mental image of the four lines gives you a head start in navigating, and I have read that every native Parisian is familiar with this general outline, in addition to the particular daily routes that he or she knows by heart. Add to all this acres of underground parking and miles of utility tunnels. And all kinds of one-off things, like the German bunker from the Second World War underneath the Lycée Montaigne, rue d’Assas, in the 6th arrondissement. For all that it looks so solid, Paris essentially sits on ground that is much like a Swiss cheese. There is so much underground that nobody has ever explored it all, and it is still possible to stumble across forgotten or unsuspected bits of the network. In 2004, the police found a cinema and restaurant somewhere under the Chaillot Hill, apparently the work of some fly-by-night operators who disappeared once their hideaway was discovered. Links: Click here to read about one adventurer’s experiences underground. There’s something about getting on a bicycle that makes you look at a city quite differently. For one thing, you become much more aware of hills. And streets that end in flights of stairs, going up or down. Suddenly, the city is full of rises and falls. Now that you can see Paris by Velib’, perhaps a quick tour of the city’s topography is in order. The highest point and best-known hill is the Butte Montmartre, which is why Sacré Coeur offers such splendid views. However, Belleville and Ménilmontant in the eastern part of the city are almost as high, and spread over a much larger area. Chaillot on the Right Bank, opposite the Eiffel Tower, is now a modest hill with a gradual slope up to the Palais de Chaillot. Originally, the hill was much higher, but it was partly levelled in 1867 for the Great Exposition that year; the rock was used to build up the Champ de Mars on the opposite bank. Still, that area has quite a few streets that end in stairs. Montparnasse, despite its impressive name and the fact that it is the site of the tallest building inside the city, is really an area of fairly gentle slopes rising up towards the south. There are two other small hills on the Left Bank. One is the Butte aux Cailles, and the other is the hill on which the Pantheon sits, the Montagne Ste-Geneviève. The flatter parts are, not surprisingly, those closest the river. 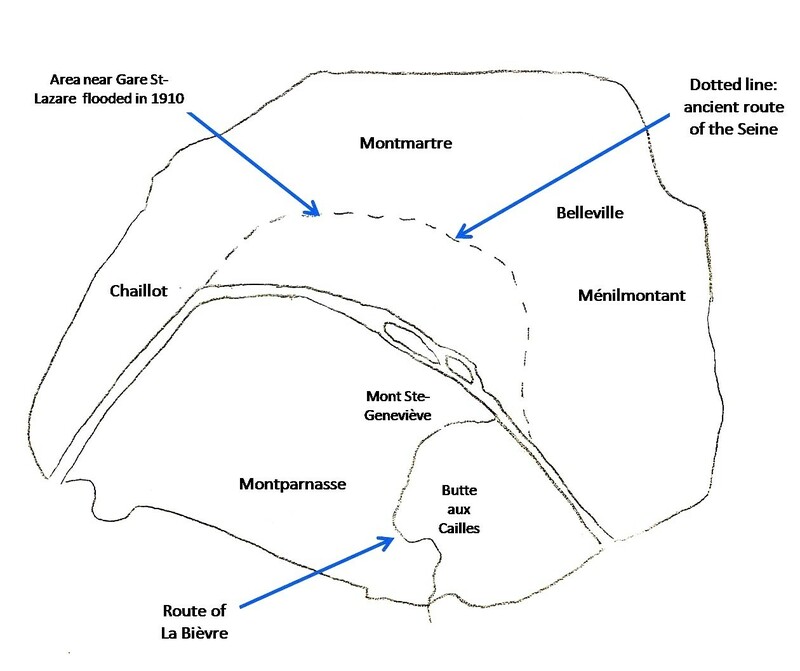 These areas are so low-lying that in January 1910, when the Seine overflowed its banks, it turned streets near the river into canals. Although these were the worst-off areas, places as far from the Seine as the area around the Gare St-Lazare were also affected. A look at a map of prehistoric Paris explains why. Thousands of years ago, much of what is now the centre of the city (the first four arrondissements) was a large island in the Seine, an arm of which flowed to the north, along the line of the what eventually became Les Grands Boulevards. Today, this whole area of central Paris is nice and flat and makes easy bicycling. Your best bet for riding from the Seine to the north of the city without working up a sweat is to follow the route of the Canal St Martin, which threads its way between Montmartre and Belleville and comes out at the Parc de la Villette. Do it on a Sunday and you get to visit some good markets along the way. Heading south, the flattest route is along what was once the course of a buried stream called La Bièvre (there is still a street of the same name), which works its way between Montparnasse and the Butte aux Cailles. Or simply follow the course of the Seine downriver in the western part of the city. Links: Read more about the Paris Flood of 1910 at Paris Under Water, which features photographs of what the city looked like during the inondations. A website sponsored by the national government offers maps and photos of the destruction along the whole course of the Seine in 1910 and another by the Mairie de Paris provides further details and photographs showing what happened inside the city.